Montana Lt. 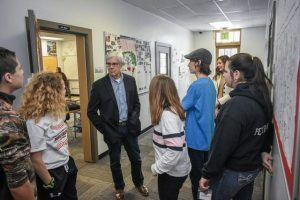 Governor Mike Cooney visited Troy’s schools Jan. 30 along with representatives of consulting firm Deloitte Services LP, as part of the evaluation phase for Internet needs and capabilities in Troy. Deloitte is currently studying the Internet situation and needs in Troy in order to create a “road map,” Cooney said during a meeting with Troy Public Schools Superintendent/W.F. Morrison Principal Jacob Francom and W.F. Morrison Principal Diane Rewerts. “We’re not here to tell you we’re here to save you, and we’ve got all the answers. But, we’re here to help you and try to bring together the resources so the community can make some progress towards putting together a plan for the future of Troy,” Cooney said.